FIU President Mark B. Rosenberg welcomes the Colombian community and other attendees to “PorColference 2019”. Every year, PorColombia – the largest organization of Colombian students and professionals in the United States – convenes leading politicians, journalists, business people and others for a day long conference to promote a strong vision of the South American country’s development and potential. 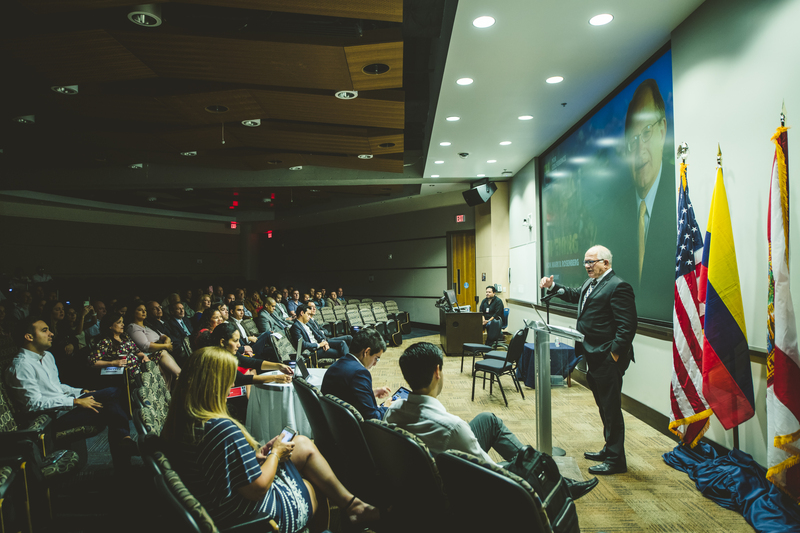 This year, the organization chose FIU to host “PorColference 2019” – in part because of the university’s longstanding commitment to promoting international understanding and developing relationships in the region that can help solve global problems. President Mark B. Rosenberg kicked off the event, highlighting what he described as the valuable role Colombians play in the international community – particularly in the face of the growing crisis in Venezuela. U.S. Rep. Debbie Mucarsel-Powell – who is a former associate dean of FIU’s College of Medicine and the first Ecuadorian-American member of Congress – acknowledged FIU for its role in shaping the future of immigrant communities in South Florida and beyond. Mucarsel-Powell described her years at FIU as among the most defining moments of her public service career. “The most important thing our country can build is the confidence and pioneering spirit of the next generation of Americans, and I believe that FIU’s efforts toward that goal stand shoulder to shoulder with any other institution in the country,” she said. Due to the crisis at the Colombia-Venezuela border, Colombian Vice President Marta Lucía Ramírez, who was initially the keynote speaker of PorColference, was unable to attend. The government aims to cease political clientelism and the suffering of people in Latin American countries, she said, emphasizing the importance of a transparent state that provides all citizens the same rights and opportunities under the constitution. She also assured the diaspora of Colombians that they are part of the administration’s plans in shifting to a better Colombia, noting the government’s three fundamental pillars of equality, entrepreneurship and respect for the law. At the top of many minds during PorColference was the effect of Venezuela’s humanitarian crisis on Colombia. Political science professor Eduardo Gamarra, who serves as advisor to PorColombia at FIU, moderated a panel on Venezuela’s road to democracy and its impact on Colombia. “About one and a half million Venezuelans have crossed the border, so they’re now all over Colombia and are affecting life in many cities, leaving an impact on health care and employment,” he said. The Venezuelan crisis is a natural fit for the PorColombia conference, Gamarra explained, because it has become a domestic issue for Colombia that needs to be responded to by the Colombian government. The various topics addressed during PorColference all traced back to the path Colombia is taking to achieve sustainable development in the region and leave its mark in the international community. PorColombia President John Moreno-Escobar urged all Colombians, and Latinos, in the United States to get involved, rally their communities and make every Latino count in the upcoming 2020 census.